Just recently, Henry Fernando released a new ebook called 'Vision 365: Mastering the Everyday Practice of Seeing'. It's not your standard 365 project that you might find online. I picked up a copy of this book and decided to follow along and hopefully flex my creative muscles on an everyday basis, as opposed to a couple of times a week. i've just returned from my recent travels over to the UK and realised that I haven't yet posted my most recent article from Light and Landscape Magazine. The article is called 'Sketching Landscapes' and can be seen below. The article discusses how you come to reach your desired composition and a little bit about learning from your mistakes. You can still see it in the magazine by checking out my previous blog post and following the links there. For now here's the article. The latest issue (issue 11) of Light and Landscape Magazine is now live! Click on the link below to take you through to the website where you can download the latest issue onto your iPad. 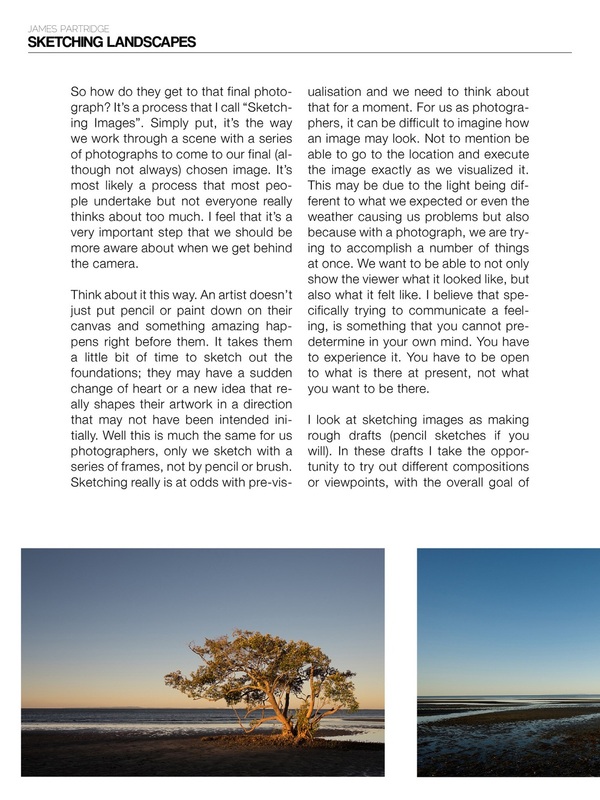 This issue contains an article that I wrote called "Sketching Landscapes", where I discuss the value of editing your images as you shoot and retaining and learning from the photographs that you might otherwise decide not to keep. Please continue to support this excellent magazine. It's time to grab a coffee, sit down and enjoy the latest news and opinion in Landscape photography. For those of you who didn't get a chance to read my latest article 'Ethical Considerations' for Light and Landscape magazine, issue 8, you can now read it here. You will find screenshots from the magazine below. take care and have a Happy Easter weekend! The latest issue (issue 8) of Light and Landscape magazine is now available. It's an excellent free to download magazine that can be found on the iTunes store. It's one of the few magazines available with no external ads and focuses 100% on photography. Please click the image above and you will be directed to the Light and Landscape magazine. Issue 8 features an article that I wrote called "Ethical Considerations". The article discusses the ethical considerations of removing objects from your photographs in post production. This article came to be after I was contacted by a reader of the magazine, with a couple of questions on this topic. As always I appreciate your feedback, your comments and your questions. Feel free to get in touch with me via my social media channels or email. Take care and enjoy the latest issue of Light and Landscape. During the week I received a request from one of my readers to publish a copy of the article 'Slow Down' that I wrote for Light and Landscape magazine (issue 6). I realise not all of you have an iPad so for those of you who were unable to view the article, I've posted some screenshots of the article below for you all to read.